In September 1931 a barbed harpoon made of red deer antler was dredged up by a trawler on the Leman and Ower Banks in the North Sea. This object was found within a block of peat and was in almost perfect condition. Although long believed to be Mesolithic, a radiocarbon date of c. 11,950–11,300 cal. BC was obtained in 1988 - the first direct date for Upper Palaeolithic human settlement on this part of the North Sea Plain. 1 "Maglemose" bone harpoon. Red deer antler, 5.7 inches long [14.6cm]. Donated to Norwich Castle Museum (NWHCM : 1932.39). Information from (S1). See photographs in file (S2). The harpoon was exhibited by Dr H. Muir Evans at a meeting of the Prehistoric Society of East Anglia on 29 February 1932 (S3). It was identified as being of "Maglemose type" and a Mesolithic, "Epi-Palaeolithic or Early Neolithic" date suggested. This object was the subject of two brief notes (S4) (S5) with a fuller account subsequently published in the Proceedings of the Prehistoric Society of East Anglia (S6). The harpoon was described as having been found "…halfway between the two North buoys in mid-channel between the Leman and Ower…[at a depth of] 19-20 fathoms". It was found within "a large mass of 'moorlog', a local name given to the lumps of black wood and peat which are found in this situation". The harpoon was recognised as being similar to Mesolithic examples that had recently been under peat at Holderness in Yorkshire. Although no samples were retained of the peat in which the harpoon was found, a number of samples were subsequently dredged up by the same trawler from sites on the Leman and Ower Banks. Pollen analysis of these sample provided evidence of mixed woodland, these results broadly consistent with samples that had previously been taken from Dogger Bank. These discoveries confirmed that much of the North Sea had once been dry land, confirming a suggestion first made by Clement Reid in 1913 (S7). 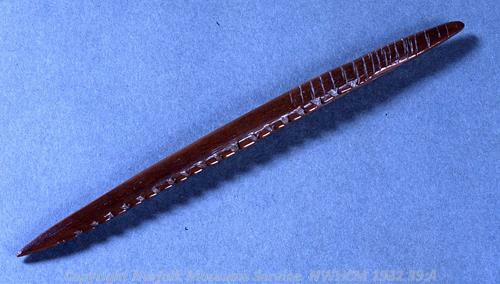 This harpoon was one of the objects listed in (S8). This object aroused considerable interest and was noted in many subsequent publications, including (S9), (S10), (S11), (S12), (S13) and (S14). The harpoon was described and figured in (S15), which also details a number of very similar barbed points from elsewhere in eastern Britain. It is also mentioned in (S16) and (S17). In 1988 the harpoon was sampled for radiocarbon dating by Clive Bonsall of Edinburgh University, as part of a national survey (S1). The radiocarbon determination obtained dated the harpoon to the Late Devensian Zone II (OxA-1950 11740 ± 150), revising the previous date of c. 6500 BC for the peat in which it was found. This later Upper Palaeolithic date was the first for settlement on the North Sea Plain in that era. See correspondence in file. This date was noted in (S18) and listed in (S19) and (S20). In recent years the topography and archaeology of the 'Doggerland' region of the North Sea have been the focus of several important research projects. See for example, (S21) and (S22), the latter of which makes specific reference to the Leman and Ower Bank harpoon. P. Watkins (HES), 27 July 2014. <S1> Archive: Clarke, R. R. and NCM Staff. 1933-1973. Norwich Castle Museum Record Card - Mesolithic. 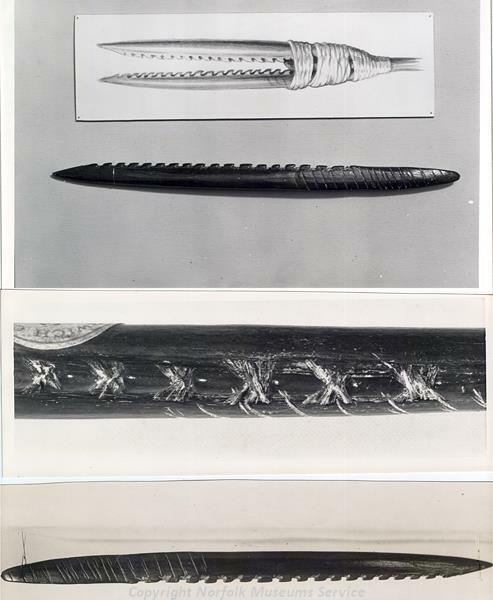 <S2> Photograph: Photographs of a Mesolithic antler harpoon from the Leman and Ower Banks. black and white. print. <S3> Article in Serial: 1932. Summary of Proceedings. Proceedings of the Prehistoric Society of East Anglia. Vol VII Pt I pp 136-137. p 136. <S4> Article in Serial: 1932. Notes and News. Antiquity. Vol 6 No 2 pp 213-221. p 218. <S5> Article in Serial: Burkitt, M. C. 1932. A Maglemose Harpoon dredged up recently from the North Sea. MAN. Vol XXXII May p 118. <S6> Article in Serial: Evans, H. M. 1932. The Maglemose Harpoon. Proceedings of the Prehistoric Society of East Anglia. Vol VII Pt I pp 131-132. <S7> Publication: Reid, C. 1913. Submerged Forests. <S8> Article in Serial: Godwin, H. and Godwin, M. E. 1933. British Maglemose Harpoon Sites. Antiquity. Vol 7 No 25 pp 36-48. pp 38, 42, 43, 46-48. <S9> Publication: 1932. A Handbook of the Prehistoric Archaeology of Britain. <S10> Publication: Clark, J. G. D. 1932. The Mesolithic Age in Britain. <S11> Publication: Burkitt, M. C. 1933. The Old Stone Age: A Study of Palaeolithic Times. p 241. <S12> Article in Monograph: Sainty, J. E. 1935. Norfolk Prehistory. Report of the Annual Meeting, 1935. Norwich, September 4-11. British Association for the Advancement of Science. Appendix pp 60-71. p 64. <S13> Publication: Clark, J. G. D. 1936. The Mesolithic Settlement of Northern Europe. p 246. <S14> Publication: Wright, W. B. 1939. Tools and the Man. Fig 42.6. <S15> Article in Serial: Clark, J. G. D. and Godwin, H. 1956. A Maglemosian Site at Brandesburton, Holderness, Yorkshire. Proceedings of the Prehistoric Society. Vol XXII pp 6-22. p 16 Fig 5. <S16> Article in Serial: Louwe Kooijmans, L. P. 1971. Mesolithic Bone and Antler Implements from the North Sea and from the Netherlands. Berichten van de Rijksdienst voor het Oudheidkundig. Bodemonderz. Jaargang 20-21 (for 1970-1971) pp 27-73. p 32. <S17> Publication: Pettersson, J. and Kristiansson, G. 1977. Hallristningar pa Tjorn. p 26 Fig 8. <S18> Article in Serial: Gurney, D. 1990. Archaeological Finds in Norfolk 1989. Norfolk Archaeology. Vol XLI Pt I pp 96-106. <S19> Article in Serial: Hedges, R. E. M. et al. 1990. Radiocarbon dates from the Oxford AMS system: Archaeometry Datelist 10. Archaeometry. Vol 32 No 1 pp 101-108. p 105. <S20> Article in Monograph: Housley, R. A. 1991. AMS dates from the Late Glacial and Early Post Glacial in northwestern Europe. The Late Glacial in North-west Europe: Human Adaptation and Environmental Change at the End of the Pleistocene. CBA Research Report 77. Barton, N., Roberts, A. J. and Roe, D. A. (eds). pp 25–39. <S21> Article in Serial: Coles, B. J. 1998. Doggerland: a Speculative Survey. Proceedings of the Prehistoric Society. Vol 64 pp 45-81. pp 45-81. <S22> Article in Serial: Faulkner, N. 2007. Doggerland: lost world of the Stone Age hunters. Current Archaeology. Vol XVIII No 3 pp 12-19.